I took a pic of the entire range – or at least the ones that made it to Kuwait – in my “Spotted at Boots” post (here). Like I said, initially, I was drawn to Fruity because of the adorable packaging but ended up going with Tropical based on the scent. I wish we’d gotten the fun ones too, like Galactic and Unicorn, but hey, beggars can’t be choosers and I’m so glad we even got these in Kuwait at all! I’ve actually watched a handful of videos on YouTube by A Model Recommends (aka Ruth Crilly) back in the day, but I could never find the products she talked about, locally (in Kuwait) so I stopped watching her videos ages ago. That said, I’m glad that Co Lab Dry Shampoo finally made it to Kuwait! I know, I know, that’s not how you spell the name, but I honestly can’t be bothered to go back and fix all the tags and category tabs and whatnot. 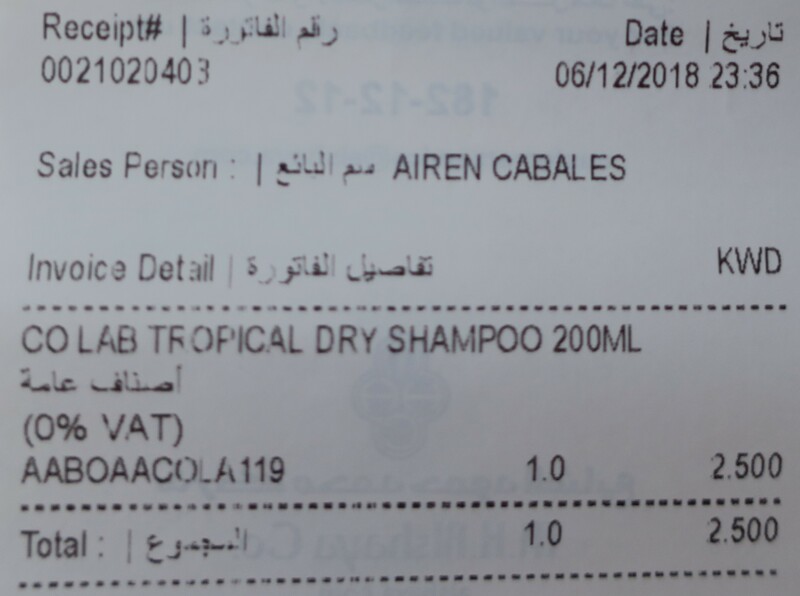 Co Lab Tropical Dry Shampoo retails for KD 2/500 and was originally only sold locally at Boots but can now also be purchased at several local cooperatives as well as Sultan Center!